Your guests will have a whale of a time at your celebration when they open bottles of wine with this cute fun smiling whale! Our all metal bottle opener is finished in a brass color metal plated finish. The opener is molded into a whale shape with an embossed smiling whale design. The tail of the whale is formed into a sturdy caste metal opener. 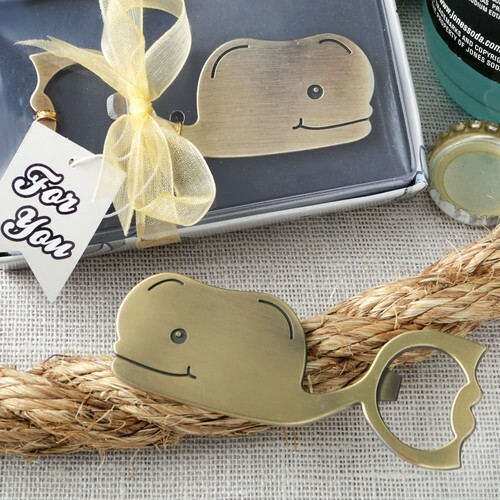 This practical and stylish bottle opener will add a touch of fun to your ocean themed event. Whale themed metal bottle opener Made from metal Molded into a whale shape with an embossed smiling design Tail is a sturdy caste metal bottle opener Brass color metal plated finish Packaged in a silver bottom box with a navy whale and anchor design Box has charcoal stage inside for the whale to rest on Box is wrapped with a metallic gold organza ribbon wrap and bow Attached to the ribbon is a banner shape 'For You' tag This fun favor is sure to be a talking point at your event!